Welcome Back, Food-Loving Friend. 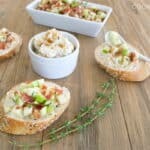 Today I’m sharing these easy appetizers for a crowd. They’re Build-Your-Own-Canapés. You barely have to do anything to prepare them. Then stand back and watch your guests be wowed. During the holiday season I become obsessed with appetizers. 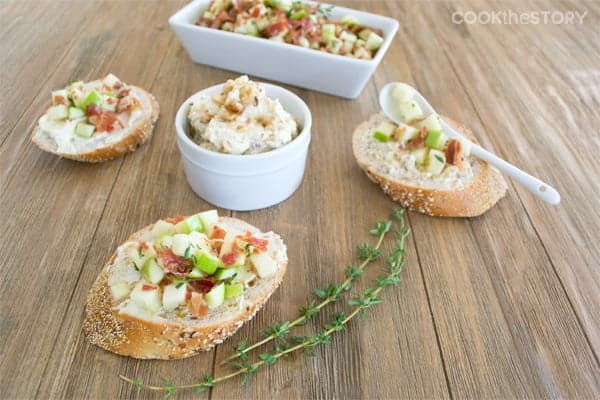 I want to have ingredients on hand to make easy appetizers for spontaneous company. I also want to stand at a friend’s house with a glass of wine in one hand and an oozey-cheese-topped cracker in the other. Because of this obsession, I’ve been telling you about a lot of easy appetizers lately. 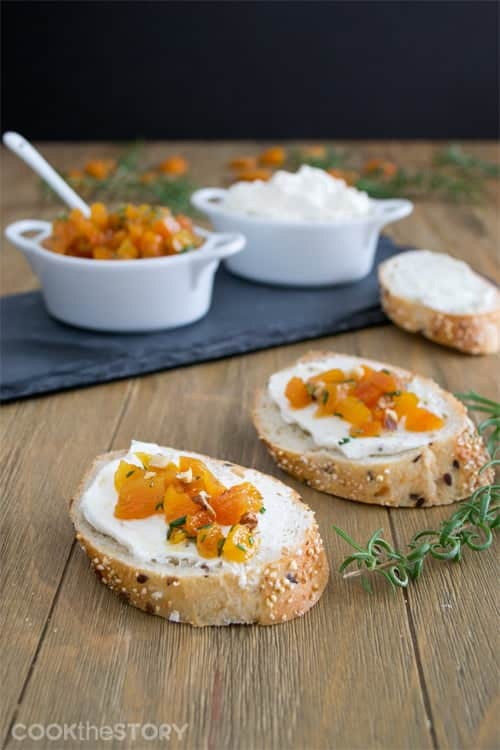 Yesterday there were these Apricot, Rosemary, and Lemon Pepper Cream Cheese Canapés. 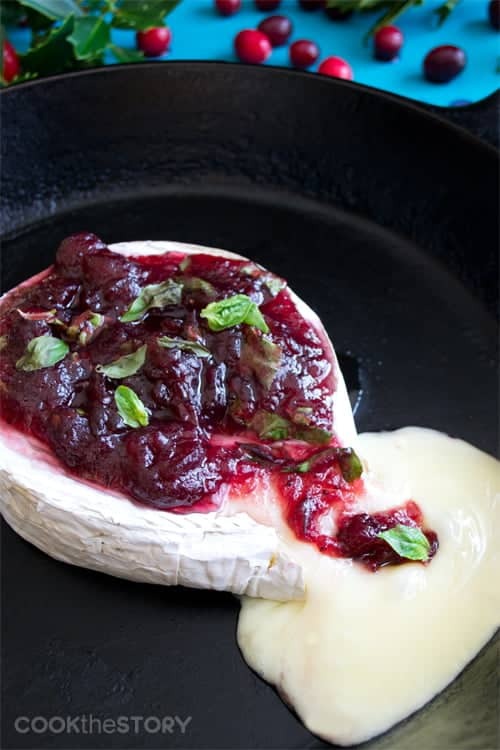 The day before that, I craved cheese all day long after telling you about this Baked Brie with Cranberry, Basil and Lemon. And last week, I went overboard with another baked cheese recipe, but this time I added bacon to the mix. 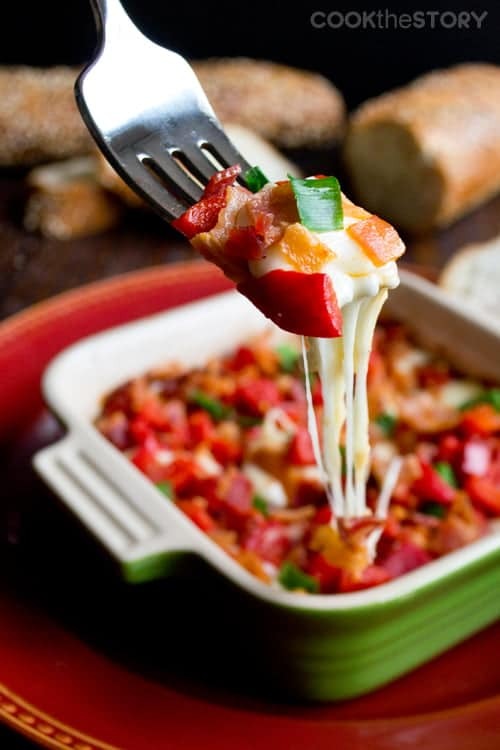 Check out this Baked Mozzarella with Bacon, Roasted Peppers and Green Onion (aren’t the colors festive?). 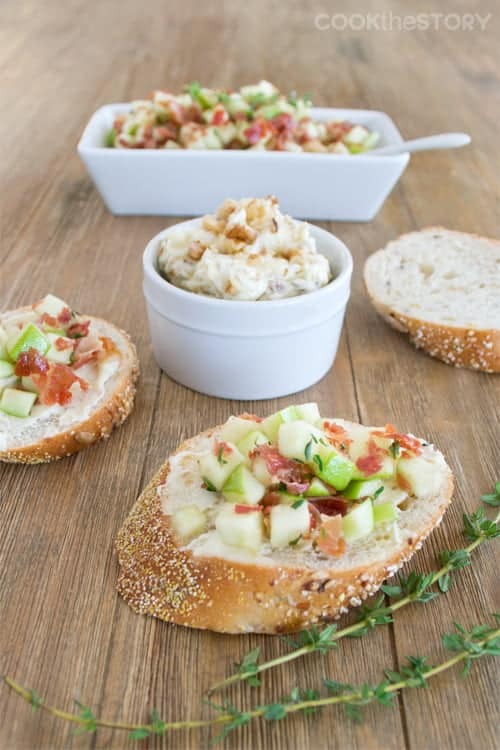 Today’s easy appetizer is bright and fresh but with that splurge-factor we all love during the holidays. It’s truly one of my favorite appetizers to make for a crowd. It’s easy, fun, tasty and it can be made ahead. You mix chopped walnuts with sea salt and butter. Then, separately, you combine chopped tart apples, honey, lemon juice, fresh thyme leaves and crispy fried prosciutto. It takes about 15 minutes to make. So easy. When your guests arrive (or when you want a tasty snack) put out some bread, the walnut butter and the apple mixture so that everyone can build their own delicious canapés. This is one of my all-time favorite appetizers for a crowd. Because the apples are tossed with honey and lemon, they won't turn brown. Even if you make this several hours ahead. Cover and refrigerate. It will be find. But if you are making it ahead, keep the prosciutto separate and stir it in just before serving so that it stays crisp. Warm the olive oil in a large skillet over medium-low heat. Add the prosciutto in a single layer (you may have to cook this in two batches depending on the size of your skillet). Cook flipping occasionally until it is shriveled and darkened, 4-6 minutes. Remove to a plate lined with kitchen towel to drain. Once cooled, chop it roughly. Meanwhile, combine the lemon juice, honey and thyme. Core the apple and finely chop it. Immediately toss it with the lemon mixture until all the apple pieces are coated. If serving immediately, add the prosciutto to the apples. Alternatively, cover the apples with plastic wrap and store in the fridge for up to 4 hours. Store the prosciutto at room temperature uncovered for up to 4 hours. Combine them just before serving. Combine the butter walnuts and 1/2 teaspoon of coarse sea salt. Taste. If you can taste the salt, it's done. If the salt is not detectable, add another 1/4 teaspoon and then try again, and again, maximally adding 1 teaspoon of sea salt total. *It's important to use unsalted butter for this recipe, otherwise it will be too salty. The amount for the sea salt given is not precise because different sea salts have different levels of saltiness and different coarseness. Rely on your taste buds. It will be great. Join in on my holiday fun in the kitchen. Click here to follow me on instagram. 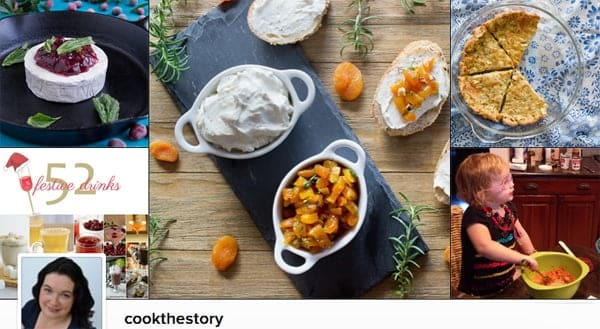 My instagram feed will make you so so hungry! Click here to follow me today. I made this for Christmas eve and it was a HIT!!! I multiplied the recipe by 3 so it was a little more time consuming. It was my first time using prosciutto and I burned a few pieces which I thought tasted a little like bacon. I’m sure u can use bacon for a more cost effective recipe or if you simply have it on hand. Thank u Christine! This recipe is going to be passed along to a few of my family members.